Rumi Neely, Nicole Richie, Kim Kardashian, and Jennifer Lopez all rocking sun hats. Free at last! Free at last! Most of us are FINALLY finished with school for the semester, meaning summer break is finally here. In middle school, my favorite way to kick off the summer was to spend a day outside on a lawn chair with a lemonade and the latest Seventeen magazine in hand. 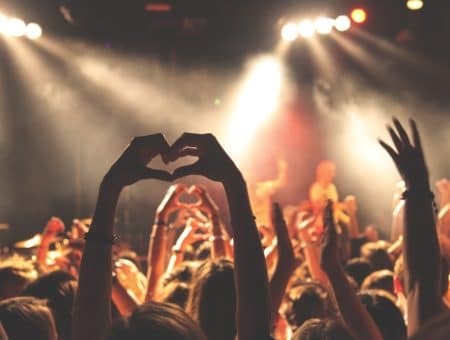 Now that I’ve gotten older, I’ve upgraded to a margarita and iPad to read fashion blogs, but the concept remains the same: The summer is ahead, so it’s time to celebrate! And what better way to celebrate summer than by dressing for the sun? Always around but now rising in popularity thanks the the comeback of ’70s fashion, those floppy sun hats you’ve seen on celebrities are hotter than ever. Once reserved just for the beach, these babies now are popular to wear with casual outfits, too. Not only do these hats look super chic, but they will protect your beautiful face from harmful sun rays and keep you cool! Ready to take on the challenge? Read on for a little inspiration! You can pick up these hats almost anywhere now — even at Forever 21 or Wet Seal! However, if it’s an accessory you will wear over and over again, it might be worth investing in a more expensive one from Banana Republic or J. Crew, as the cheaper versions tend to lose their shape after you wear them a few times. These hats have a major retro vibe to them — they will go great with bell bottoms, high waisted shorts or skirts, clogs, anything crocheted, and of course huge pairs of sunnies! These also work great as a bohemian accessory. Try wearing one with a peasant top, maxi skirt, or pair of fringed boots. Try wearing a floppy sun hat with a summery dress. It’ll work with anything from a maxi dress, Sunday sundress, or a floaty beach cover-up. Speaking of poolside cover-ups, these are ideal when sunbathing. Even the strongest sunscreen can leave your face under-protected. Combat harmful UV rays by rocking a floppy hat to shield your most delicate skin from the sun. Having a lazy day? Wear a sun hat to cover up greasy roots. Your hat’s natural texture will look great underneath! These hats really look great with anything, so don’t be afraid to try one out. Check out how chic Kim Kardashian and Nicole Richie look in the photos above! A vintage-inspired outfit like this is the perfect way to rock a floppy sun hat! Tuck a striped shirt into a pair of high-waisted shorts, and add a cute necklace and quirky pair of sandals. Finish your look with a floppy sun hat (or course) and a retro pair of sunglasses. As mentioned before, these hats are absolutely perfect for a day at the beach or pool. A floppy hat will look super chic with anything, but try it out with a flowy dress for a taste of the Caribbean. Finish with a pair of sandals. I picked up this hat last summer and wore it constantly. As you can see, I’m very pale and thus prone to burning, and I’m terrified of sun damage! So this was a practical choice for me, as well as a fashion-forward one. I put together the rest of my outfit following my usual style of comfortable neo-hippie. My mom wanted to steal my hat after seeing my pictures! Want to see more of Hannah’s incredible style? Check out her blog here! 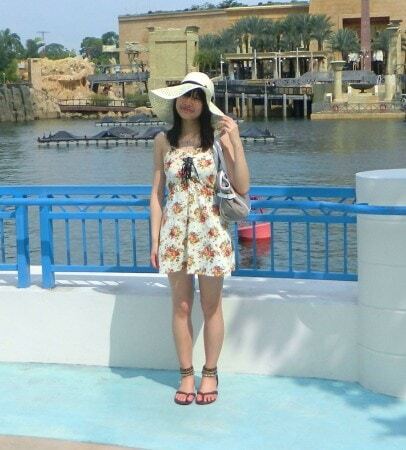 It’s an outfit created for a vacation – the location of the photo is Universal Studios, Singapore. It was a hot and sunny day, so the floppy sun hat is perfect! For more of Kristie’s sweet style, check out her blog here! Rocked the Challenge? Want Some Traffic on Your Blog? Send Us Photos! If you wore a floppy sun hat this week, take a couple snapshots and send them to fashionchallenge AT collegefashion.net along with your name, school, a quick explanation of why you chose your look, and the URL of your blog if you have one. We’ll feature photos here to inspire other lovely CF ladies! Have you been rocking this look for a while, or are you new to the sun hat bandwagon? Where did you get yours? What do you like to wear it with? Leave us a comment and tell us what you think about this trend! 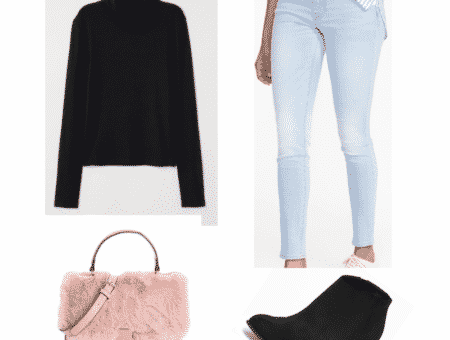 Next How to Dress Like Ashley Greene… for Less!